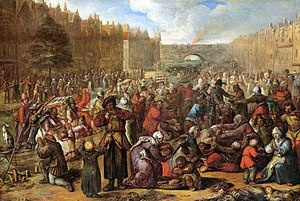 The Aichty Years' War or Dutch War o Unthirldom (1568–1648), began as a revolt o the Seiventeen Provinces against the poleetical an releegious hegemony o Philip II o Spain, the sovereign o the Habsburg Netherlands. ↑ The Dutch States General, for dramatic effect, decidit tae promulgate the ratification o the Peace o Münster (which wis actually ratified bi them on 15 Mey 1648) on the 80t anniversary o the execution o the Coonts o Egmont an Horne, 5 June 1648. See Maanen, H. van (2002), Encyclopedie van misvattingen, Boom, p. 68. ISBN 90-5352-834-2. This page wis last eeditit on 3 October 2015, at 13:37.